Give your hip cat an affordable Brooklyn address with this borough-inspired retreat. Curl up in an ordinary cardboard box? Fuggedaboutit! 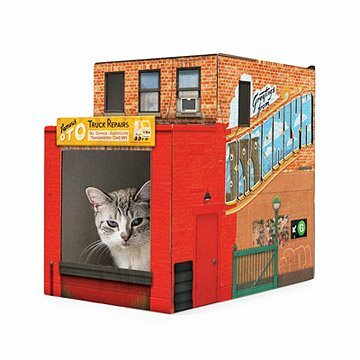 Give your hip cat an affordable Brooklyn address with this retreat inspired by New York's beloved borough. A great spot for snoozing and post-worthy pictures, the easy-to-assemble building features endearingly gritty graphics, including a French bistro, truck repair garage, and even an entrance to the notorious G train. Made from 33% recycled cardboard, it's a non-toxic, recyclable, and biodegradable haven for your furry friends—small dogs, too. Designed in Brooklyn; made in Pennsylvania. Swedish designer/illustrator Måns Swanberg creates toys designed to inspire imaginative play and engage parents just as much as their kids (and pet "kids"). His artwork combines photorealistic renderings and rich, hand-painted color. All of Måns's designs are made in Brooklyn, and the products—which are non-toxic and biodegradable—are printed at a facility in Pennsylvania. Måns's work has received awards from Parent’s Choice and has been featured in New York Magazine and the SwissMiss blog. Welcome accessory for our foster kitty and loves his new home. Purchased as a gift for my sister (well, really her cat-child). She seems to love it. Beautiful and hilarious. Gunther the wonder cat claimed it as his own as soon as it was set up. Very creative and fun design! The designer is very talented to have thought of this charming feline playhouse. My kittens love hanging out in this box. I've placed some toy mice in there, and occasionally a soft pad. Wonderful and fun! And it brings back memories of Brooklyn. As an ex New Yorker, this was a cool way to have a sleeping/ play area for my new kitten, and he actually plays in it!